EAST Sepik students attending the University of Papua New Guinea completed a Frieda mine awareness report last week. 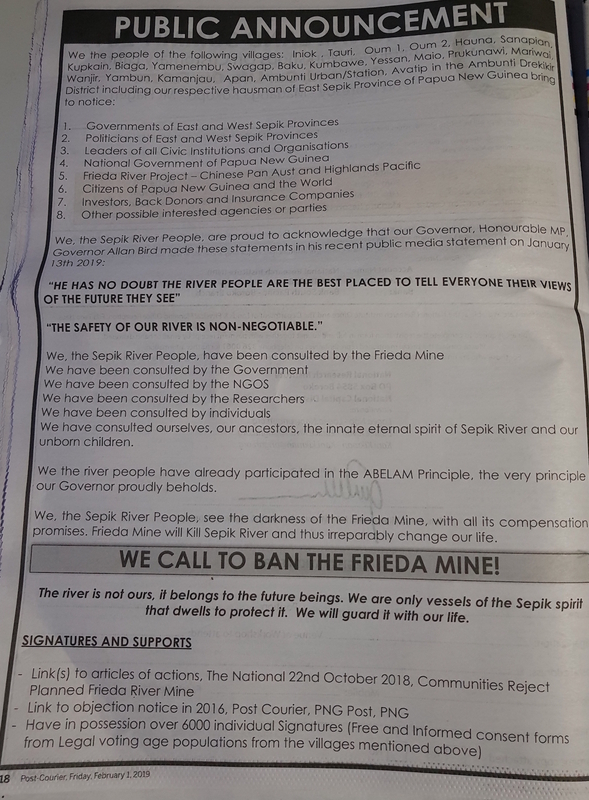 The report is from an awareness campaign against the proposed Frieda mine that was carried out by the UPNG Avisat Students Association comprising of students from Ambunti, Gawi and Angoram in East Sepik. Association president Dipson Ban said they carried out a two week awareness from Dec 9-21 last year from Iniok, Tunap Hunsten LLG to Avatip, Ambunti LLG of East Sepik. Ban said they covered villages that were vulnerable to the proposed mine, educating people to understand and to make wise decision to save the Sepik River. “The awareness campaign was intended for the benefit of everyone in the community and not only Sepik river people. The awareness was the initiative of UPNG Avisat Students Association and supported by sponsors including Mariwia Ltd, Hungo Ltd plus contribution from various Sepik communities. “The final report will be presented to East Sepik government for policy purposes,” Ban said. 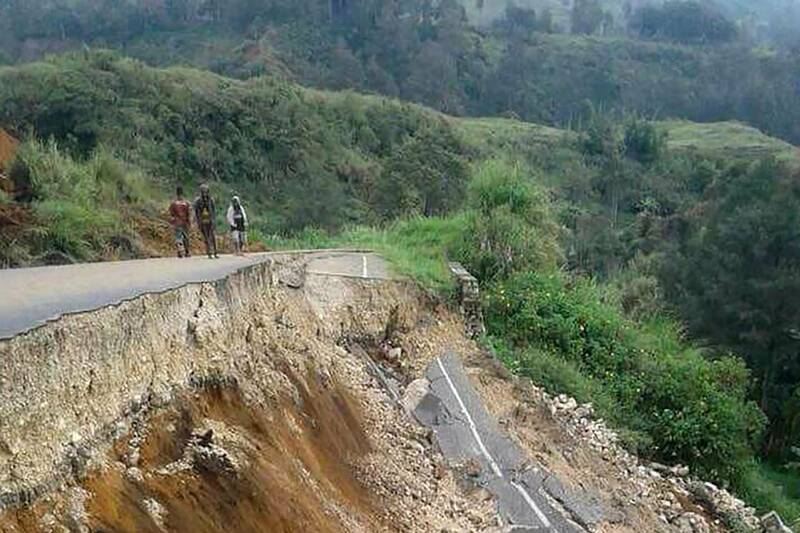 An earthquake measuring 5.6 on the Richter scale jolted 9 km northeast of Ambunti, Papua New Guinea at 1847 GMT on Wednesday, the U.S. Geological Survey said. The epicenter, with a depth of 132.36 km, was initially determined to be at 4.1824 degrees south latitude and 142.9124 degrees east longitude. 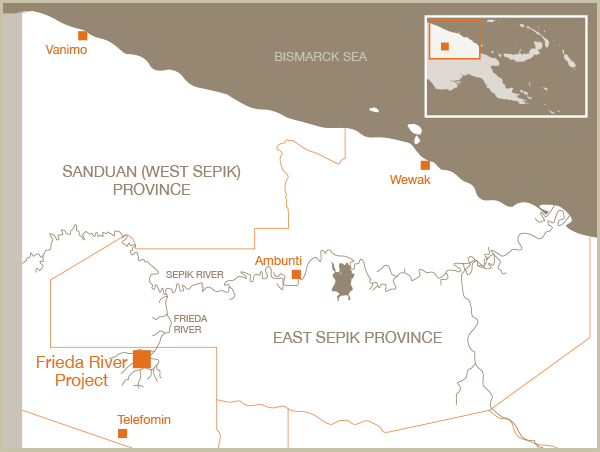 The Frieda River mine will be 70kms south of the Sepik River on the border of the Sanduan and East Sepik Provinces and some 500kms upriver from the coast. The September 2018 signing of Frieda River mine project accord by PanAust – the developer and the landowner groups as reported in the other paper was good news for the government. The Governor of West Sepik, Tony Wouwou said in part “… the accord committed all parties to ensuring peaceful and constructive cooperation”… and “… everyone must work together to resolve differences amicably and without disruption to the project …”. Let’s hope they all remain committed to the terms of this accord. I have three points to raise here. First is the issue that continues to raise eyebrows. It is about the ownership of the underground resources. Who owns the oil, gas and minerals on customary land? Is it the landowners, the government, or the developer? The truth is; landowners own the land but not the underground resources. Why this is so, is because there are man-made laws that deny them full rights to their resources, hence they don’t get a fair share of the proceeds. When the job is done, the developer packs up and leaves behind land and environmental completly reshaped. A change of law will certainly make a world of difference in favour of the landowner communities. My second point is on the Sepik River. 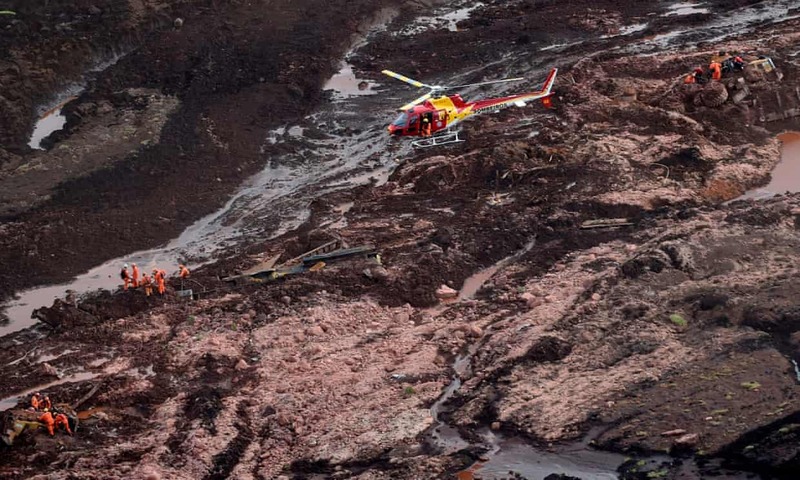 Governor Wouwou made no mention of a tailings dam, or Sepik River to be the passageway for the shipment of mineral ores, but said that a tailings pipeline would be built across the border in East Sepik. The people of Angoram and Ambunti-Drekikir, whose survival depends on the pollutant-free Sepik River are denied their rights to discuss risks that Frieda mine pauses to the Sepik River. The simple villagers have no idea whatsoever on the imminent risks they are about to face. 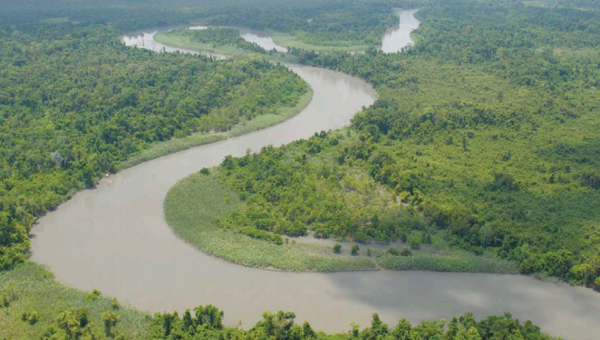 Despite the ignorance, there is a real possibility of serious environmental impacts that Frieda River mine activity can cause, as there is no guarantee that what happened to Fly River and now the Ramu River won’t happen to the Sepik River. I raised this very concern last year, which was supported by the environmental scientist Alphonse Roy, who presented some related factual information based on his two “early warning study proposals” which he presented to the Angoram district administrator and others, now locked away or trashed. May I appeal once again to the developer is to meet and listen to the Sepik River leaders and get first hand information on how this river has been their lifeline for many generations? They want to know how prepared PanAust is, in terms of the provision of alternative water services, fish stock preservation and health services in communities along the Sepik River to mitigate the impacts brought on by intentional and accidental mine rejects. Thirdly, can the government quickly confirm if PanAust has been taken over by the then major shareholder, Guangdong Rising Assets Management – a Chinese state-owned company? If so, they must make Sepik River the safest? Papua New Guinea of all places in the world should know better than most other advancing, under developed and developing worlds what the price of new world class mines operations entail. The industry itself is so sophisticated and complex that for an infant resource based country like PNG, the understanding and economics of the business has yet to be fully understood and appreciated. That is not to say PNG has not had its say and experienced what it means because the country’s history itself has demonstrated to the world what can and cannot go wrong in such developments. It is a painful memory to give Bougainville as an example because that was the first ever manifestation of a culmination of events that took place because of the absence of modern day dialogue between developers and the local people of PNG. Bougainville is too painful an experience to always delve on due to the that it was the first time ever that a civil war was fought on PNG soil. PNG’s experience are the two World Wars where it was not spared the agony of witnessing human beings being slaughtered and killed at random at the behest of two or more foreign powers attempting to take control of the world. PNG was just caught up in the international quagmire of geo-political and militarily ambitious strategic to be the best in the world. The point here then is that PNG is not short of world or international experience and exposure that it has learnt or not from. In this case Wafi and Golpu plus Freida River proposed gold and copper mines are the perfect opportunity to showcase what PNG can do when it comes to benefit streams which is what all landowners are screaming murder about at the moment. So with the unique experience that many of PNG’s outstation and communication officers process, perhaps the two new mining projects should set the new standards and technical understanding of what new resources development projects should be realigned in relation to connections with local people. This is as opposed to the standard policies and principles contained within all mining and other resource projects agreements and understandings. This means where there is no clear clarification of how best landowners should be involved in progressive developments be they technical or project economics, they should be debriefed like all other stakeholders. It is about time where local landowners considered illiterate and uneducated are left out from the technical briefings provided and with the wishful thinking that community liaison officers can best do the job on behalf of developers and investors to explain basic project economics to curtail resentment. Landowners should be engaged from day one until project agreements are signed so as to avoid the prevailing misconceptions about who benefits most from the millions invested in projects.